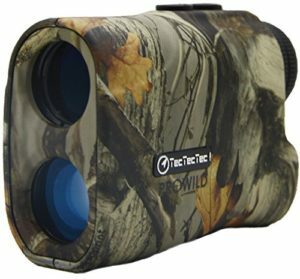 A relatively inexpensive model which still offers a great set of features, the TecTecTec ProWild is one of the best rangefinders for any hunter out in the field, novice or experienced. The low price shouldn’t fool you, as this is actually a premium model with advanced functionality and very precise output, and it’s one of those hidden gems in the market that people are usually surprised to learn about. Measurements go up to 540 yards in standard mode, and the device supports continuous scanning as well. Accuracy is guaranteed up to 1 yard, which is a good number for rangefinders in general, not just for this price range. All output is presented directly through the lens in a clean, intuitive interface that shows you everything you’ll need to see in one convenient spot. On that note, we were pleasantly surprised by how well the interface looks and how easy it is to pick up, unlike some other similarly priced devices. Cheap rangefinders have a reputation for being difficult to get around, but this is one of the more solid exceptions on the market. Speaking of solid, another great aspect of the TecTecTec ProWild is its build quality, featuring high-grade materials and a compact design that’s very portable. The premium quality of the construction was something that left a solid impression with us, and it’s actually surprising that the company has gone so far in this regard, considering how little they’re charging for the rangefinder. On top of that, you’ll also get a carrying case and a lanyard for added portability, and it’s clear that TecTecTec wanted to emphasize this aspect of the model. The camouflage design only serves to add to its utility as a great hunting tool, and once you’ve been out with this model once or twice, it will likely become an inseparable part of your inventory and you’ll feel odd going out without it. Of course, you may want to upgrade to something more advanced sooner or later, but the TecTecTec ProWild should serve you well for a very long time if you need simple, but reliable functionality.